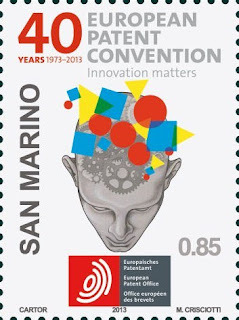 On the 17th of October 2013 the European Patent Office will celebrate the 40th Anniversary of the European Patent Convention (EPC) in Munich. The celebrations will be attended by the President of the European Council, Mr Herman Van Rompuy, official representatives of all the 38 member states, including the Republic of San Marino, and numerous other dignitaries from the worlds of politics, industry and intellectual property. The philatelic issue designed by Mariangela Crisciotti will be presented on the occasion of this event. 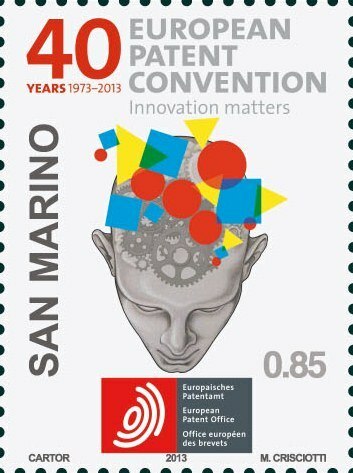 The 0,85€ value depicts a devising human mind, the motto “40 YEARS 1973-2013 -INNOVATION MATTERS” and the logo of the Organisation with a fingerprint.